Biography of Italian Baroque Painter, Caravaggist. Part of the generation most influenced by Caravaggism, the Italian Baroque painter and Caravaggist Artemisia Gentileschi is one of the most famous female Old Masters of her time. Precociously gifted in both painting and drawing, she was the first female artist to be elected a member of the Academy of Art in Florence (Accademia dell'Arte del Disegno). Noted for her powerful biblical art - one of her specialities was the theme 'Judith and Holofernes' - her acknowledged masterpiece is Judith Beheading Holofernes (1620, Uffizi Gallery, Florence), one of the best Baroque paintings. Although her reputation was once eclipsed by that of her father, the Mannerist painter Orazio Gentileschi (1563-1639), Artemisia is now regarded as one of the most important exponents of Baroque painting, in 17th century Italy. Born in Rome, the eldest child of the Tuscan painter Orazio Gentileschi, a personal friend of the Milan-born genius Caravaggio (1571-1610), Artemisia absorbed the art of painting in her father's studio, where she quickly outshone her brothers. She was trained in drawing, how to mix colour pigments and how to paint. Since her father was a keen exponent of Caravaggism, she too employed the heavy chiaroscuro and dramatic tenebrism of the style's founder, although her naturalism and realist handling of subjects contrasted sharply with that of her father who favoured a more idealized approach. In 1610, two things happened. She was raped by her art tutor Agostino Tassi (1578-1644), a highly unsavoury individual, who reportedly did the same to his sister-in-law and was suspected of murdering his wife. [Put on trial in 1612 for his offence against Artemisia, Tassi was briefly imprisoned, then exiled, but his sentence was quashed in 1613.] In addition, she produced her first major work Susanna and the Elders (1610, Schonborn Collection, Schloss Weissenstein, Pommersfelden), one of the few versions to show the sensual attack of the two Elders as a traumatic event. Supposedly painted after her experience with Tassi, its appearance so close to the assault seems rather a coincidence. Following the trial, Artemisia painted Judith Beheading Holofernes (1611-12, Museo Nazionale di Capodimonte, Naples), a subject of Christian art to which she would return many times. The violent intensity she used to show the death of Holofernes at the hands of his female assailant has been construed by critics as pictorial pay-back for her earlier ill-treatment. In 1613, Artemisia Gentileschi was married to the Florentine artist Pierantonio Stiattesi, and not long afterwards moved with him to Florence. Here, she enjoyed a highly successful career as a court painter, under the patronage of the wealthy Medici family, notably Grand Duke Cosimo II, while giving birth to four sons and a daughter, of which only her daughter, Prudenzia, survived. She also became the first woman to be elected a member of the Academy of Art in Florence. Her religious paintings from this period include Virgin and Child (Madonna Lactans) (1610-20, Uffizi Gallery, Florence), St Cecilia Playing a Lute (c.1616, Galleria Spada, Rome), as well as Judith and Her Maidservant (1614-20), and The Penitent Mary Magdalen (1618) both in the Palazzo Pitti, Florence. She also decorated the ceiling of the gallery at the Casa Buonarroti - built to commemorate Michelangelo - with a fresco of the Allegory of the Inclination, whose subject purportedly bears a close resemblance to Artemisia. 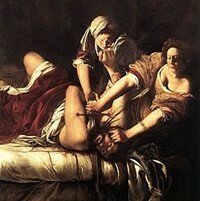 Lastly, she completed her finest version of Judith Beheading Holofernes (1620, Uffizi, Florence). Following issues with her creditors, Artemisia returned to Rome at roughly the same time as her father departed for Genoa. It is unclear whether she followed him there or remained continuously in Rome. At any rate, in 1627 she had a second daughter. During this time, the influential styles of Roman painting embraced Caravaggio-style tenebrist works as well as the classical paintings of the Bolognese school led by the Carracci and the Baroque manner of Pietro da Cortona. But commissions were both thin on the ground and highly competitive. As a result, despite her friendship with Cassiano dal Pozzo (1588-1657) the wealthy collector and well-connected secretary to Cardinal Francesco Barberini (1597-1679), patron of the great Frenchman Nicolas Poussin (1594-1665), she found it tough going. Instead of securing lucrative commissions for altarpiece works, she was reduced to producing commercial portrait art and expressive Biblical heroines. Perhaps because of this, it is believed she moved to Venice for the period 1627-30. Notable works from the 1620s, all of which are difficult to date exactly, include: Lucretia (c.1621, Palazzo Cattaneo-Adorno, Genoa); Portrait of Gonfaloniere (Collezioni Comunali d'Arte, Bologna); Judith and her Maidservant (1620s, Detroit Institute of Arts); The Sleeping Venus (1620s, Virginia Museum of Fine Arts, Richmond); and Esther and Ahasuerus (1620s, Metropolitan Museum of Art, New York). In 1630, in search of more lucrative commissions, Artemisia travelled south to Naples, home of the Neapolitan Spaniard Jusepe Ribera (1591-1652), where she remained for the rest of her life, except for brief trips to London and a few other places. She developed excellent relations with the Duke of Alcala, and began working on paintings for Pozzuoli Cathedral. Known works from this period include the Annunciation (1630s, Museo Nazionale di Capodimonte, Naples), Birth of Saint John the Baptist (1630s, Prado, Madrid), and Corisca and the Satyr (1630s, Private Collection). See also: Painting in Naples (1600-1700). For more detail, see: Neapolitan School of Painting (c.1600-56). In 1638 Artemisia went to work alongside her father at the court of King Charles I in London, where Orazio was court painter. While in London, he was commissioned by Charles to paint the suggestive Self-Portrait as the Allegory of Painting (1630s, Royal Collection, Windsor). Sadly, in 1639, Orazio unexpectedly died, after which Artemisia's movements become somewhat unclear. We know she had left England by 1642, and that by 1649 she was back in Naples, where she enjoyed good relations with the important collector Don Antonio Ruffo of Messina (1610-78) who became one of her patrons during this second Neapolitan period. Originally, it was thought that Artemisia died around 1652/1653, but recent research shows that she was still undertaking commissions as late as 1654. This being the case, a strong possibility exists that she was carried off in the devastating plague that swept Naples and surrounding areas in 1656. As well as being the first important female painter to succeed at the highest level of her art, and thus blazing a trail for her successors, Artemisia Gentileschi showed a clear mastery of chiaroscuro and tenebrism, and developed a highly realistic (sometimes brutally direct) style of painting. Although influenced both by Caravaggio and her father Orazio - she was perhaps more affected by the dominant styles of the cities and regions in which she was active. Her reputation as one of the important contributors to Baroque art has been considerably enhanced in the eyes of Feminists by her apparent independence of thought. First known Flemish woman portraitist. The most successful female painter of the Italian Renaissance. Portraitist and history painter; first woman artist to paint female nudes. Mannerist artist, noted for her Renaissance style religious oil paintings. Paintings by Artemisia Gentileschi can be seen in many of the best art museums in Europe and America.  For analysis of important paintings, see: Famous Paintings Analyzed.